Toozalii use many different art forms to enable and to provide social inclusion workshops for minority groups within mainstream Arts events. Last year, they came to Hakodate and ran flag workshops for us. They were also part of our “Outreach” program of working with schools and other institutions in town. They took all the drawings back to the UK and have been happily turning them into amazing batik flags with UK schools and university students. 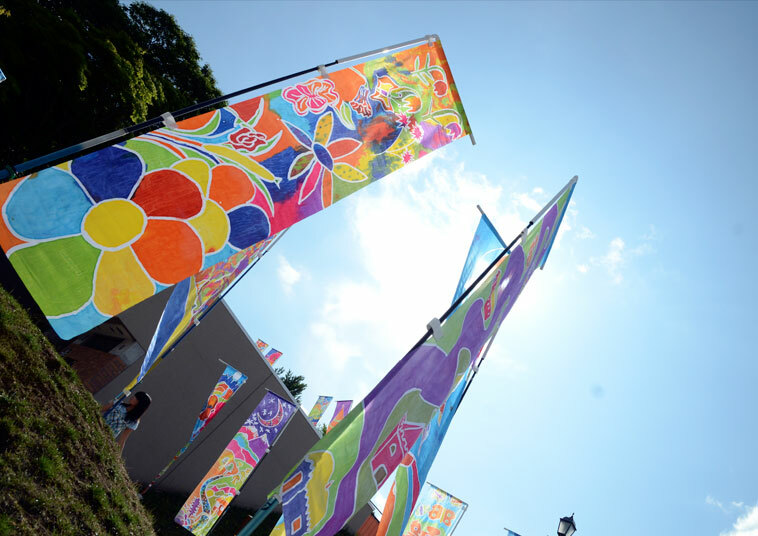 You can see the results of their (and your) work in Motomachi Park this year. And we have some news: Toozalii are creating an exhibition using the flags made in Japan called “World’s Eye”. They already have two agreed venues for showing the exhibition in 2014 and 2015 in the UK: Worcester Cathedral and Salisbury Cathedral! So, we need more designs. This is your chance to become an international artist, so why not try your hand at drawing a flag? It takes less than half an hour. Please check the schedules for our drop-in workshops in Motomachi Park.